Sea horses are a type of marine animal found throughout the world's oceans. They are actually a type of fish, with a long, curling tail, a spiny body, a crowned head, and a protruding snout that resembles a horse. Sea horses have sweet and warm properties, and are associated with the Liver and Kidney meridians, according to the precepts of traditional Chinese medicine. Among the conditions sea horse is used to treat are asthma, infections of the throat, insomnia, and abdominal pain. 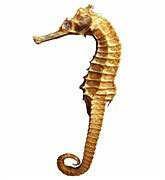 Sea horse is also believed to be a powerful aphrodisiac, and is often taken to increase sexual potency. Sea horse can also be applied to the skin to treat skin infections and sores. How much sea horse should I take? The amount of sea horse to be consumed depends on the condition being treated. The typical dose is between 3 and 9 grams, mixed with boiling water and drunk as a decoction. If powdered sea horse is being used, smaller doses (1-3 grams) are recommended. For impotence, some practitioners recommend a mixture of 3 grams of powdered sea horse, taken three times per day with rice wine. Powdered sea horse can also be applied externally. What forms of sea horse are available? Whole, dried sea horse can be found at some herbal shops and Asian markets. Powdered sea horse is also available, usually as a pill, powder or capsule. What can happen if I take too much sea horse? Are there any interactions I should be aware of? What precautions should I take? Sea horse should not be taken during pregnancy, or by patients who have been diagnosed with yin deficiency. In addition, long-term use of sea horse at high doses could lead to possible kidney damage. As of this writing, there are no known drug interactions associated with sea horse. As always, make sure to consult with a licensed health care provider before taking sea horse or any other herbal remedy or dietary supplement. Chen JK, Chen TT. Chinese Medical Herbology and Pharmacology. City of Industry, CA: Art of Medicine Press, 2004, p. 900. Gould SJ. A sea horse for all races. Nat Hist 1995;104(11):10-5, 72-5. Hawkins D. Pretty horses. Keeping the sea horse from falling victim to its own charisma. U.S. News & World Report January 20, 2003;134(2):64, 66. Teeguarden R. Radiant Health: The Ancient Wisdom of the Chinese Tonic Herbs. New York: Warner Books, 1998, p. 212. Walther C. Hippocampal terminology: concepts, misconceptions, origins. Endeavour June 2002;26(2):41-4.